A war of humans, not heroes. I’m going to make a bold claim here. Captain America: Civil War is the best MCU movie to be made to date. I know, I know, I’m probably a little overzealous when I say that. Except that I’m not. I’m fully aware of what its competition is. There are two other Marvel movies that I can compare Captain America: Civil War with. Those two are Iron Man and The Avengers. All three of them are exciting, suspenseful, nail-biting, eye-widening entertainment that are just as fun and memorable as they are emotional and meaningful. They’re not just great superhero dramas. They’re great human dramas. But Captain America: Civil War is especially unique to even these entries. How? The biggest reason is because it isn’t formulaic. In Iron Man and The Avengers, we had our heroes, our villains, and they went at each other like rock-em sock-em robots. Granted, there’s deeper insight and perspective than just the two-dimensional hero/villain foreplay, but you can’t deny the framework that’s there. There’s a clear cut good guy and bad guy, as there is in most superhero movies. But that black-and-white sense of morality isn’t well defined in Captain America: Civil War. In fact, there isn’t really an established sense of right and wrong in the picture, just characters whose ideals and values clash violently with each other. You can argue that there is a quote-unquote “villain” in the movie, but he’s more of a viewer than an active participant to the conflict involved. If we have to go by titles in this movie, what we have then is hero against hero, Avenger against Avenger, and friend against friend. The ensuing action is nothing else but thrilling, thought-provoking, mind-blowing, and heartbreaking. In this sequel to both Captain America: The Winter Soldier and Avengers: Age of Ultron, Steve Rogers, a.k.a. Captain America (Chris Evans) leads a new team of Avengers, consisting of Black Widow (Scarlett Johannson), War Machine (Don Cheadle), Falcon (Anthony Mackie), Vision (Paul Bettany) and Scarlet Witch (Elizabeth Olsen). After an international event involving the Avengers ends in high casualties, General Thaddeus Ross (William Hurt) and Tony Stark, a.k.a. Iron Man (Robert Downey Jr.) step in to introduce the Sokovia Accords, which states that the Avengers would no longer be a private organization, but instead will be employed and assigned missions by a United Nations panel. There are two perspectives to the Accords. On one hand, the Accords would give a new level of accountability to the Avengers. They would be restricted in where they could go and what they could do, and the public casualties in turn could be lessened. Plus, the Avengers would now get paid for all of their superheroing. On the other hand, this could put a level of control and interference on the Avengers that would prevent them from doing the most good. Plus, being assigned to report to a panel leaves them vulnerable for manipulation, forcing them to do things that they wouldn’t otherwise. Iron Man leads the side that’s for the Accords: Cap leads the side that’s against it. But regardless of both sides, there’s another player in the field whose looking to manipulate both sides to his advantage. And neither side realizes it until its too late. The second Marvel movie to be directed by brothers Anthony and Joe Russo and the fourth to be written by Christopher Markus and Stephen McFeely, Captain America: Civil War is a superhero movie ripe with context, a movie that asks uncomfortable questions that we would much rather remain unanswered. Just like how The Winter Soldier related its plot to today’s world of government control, survaillance, and corruption, Civil War also relates to real-world issues that appeals just as much to reality as they do to fantasy. Take, for instance, the introduction of the Sokovia Accords. These documents, much like the connection between S.H.I.E.L.D. and H.Y.D.R.A. in The Winter Soldier, presents the theme of government interference and how those implications affect our world. Yes, the Accords would impose an element of control and responsibility over the heroes, but at what cost? This is a situation where civil liberties are being traded for security, and the question is raised on whether its a good trade or not. Juxtaposing this idea of control in between our heroes raises very important questions: questions that are startlingly resemblant of our world abundant with government surveillance and manipulation. But the movie doesn’t suffer under its philosophical weight. This is still one of those fast-paced, funny, exciting Marvel movies that you’ve come to love. It’s just now a fast-paced, funny, exciting action movie that has deeper insight and drama than the previous entries did. The issues involved draw us deeper into the film’s conflict and to each of the outcomes that these characters face. There are two of these characters that I haven’t mentioned yet. One of them is the rebooted Peter Parker/ Spider-Man, who is played here by Tom Holland as opposed to the recently discontinued Andrew Garfield. Holland’s appearance in the film is brief yet significant, and while he doesn’t serve a role as important as the others, his charisma, immaturity, and innocent charm makes him for a very entertaining and memorable character, one who sticks out in my mind just as much as Captain America and Iron Man. To be rebooted in just two years time is definitely too soon, and part of me wonders how well Garfield would have done if he had been given the same opportunities as Holland was. That doesn’t take away from the fact that Holland still wins us over and sticks out in our minds just as strongly as Garfield and Toby Maguire does. He makes me very excited to see what’s in store for him for his eventual return in Spider-Man: Homecoming. The other character is T’Challa, a.k.a. the Black Panther (Chadwick Boseman). If there is a neutral side in this conflict, it is in T’Challa, although at one point he does fight on Iron Man’s team. He’s so great because unlike Iron Man or Cap, his perspective is the most human out of the other players. He is the citizen Cap and Iron Man are fighting to protect. He is the one that faces the most casualty out of any of the other players. This natural perspective into the film is so important, because it demonstrates an investment that isn’t coming from another superhero: it’s coming from the victim of both sides of the conflict. That pain and confusion is so important to understand Captain America: Civil War not just as a Marvel movie, but as a complex drama on its own two legs. The performances, the action, the visual effects, and the direction all accumulate masterfully, and the Russo brothers demonstrate a better understanding of their characters than they did in Captain America: The Winter Soldier. What we have left, then, is an unchallenged masterpiece, a moral dilemma packaged as a superhero blockbuster that excites us just as much as it challenges us. Iron Man and The Avengers both challenged themselves morally and ethically, but not so much to the point where it’s entire plot was founded around it. There was still a right or wrong in those movies. 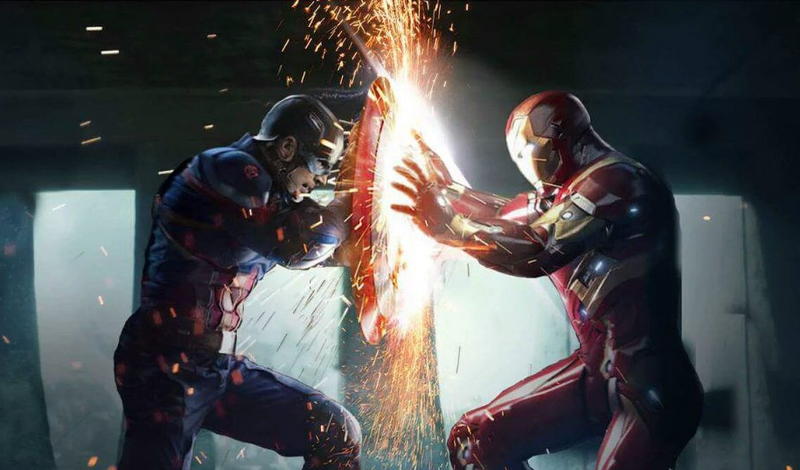 There isn’t in Captain America: Civil War, and that makes it just as compelling as it is entertaining. The one downside to this film’s success: now the Russo brothers have to follow this up with Avengers: Infinity War. I don’t know how they’re going to do it. I would personally guess that they can’t do it. But I’ve been wrong before. The Avengers face judgement day. We are now nearing the end of Marvel’s phase two of its cinematic universe. Before Age of Ultron, we’ve seen ten of these movies now. Iron Man. The Incredible Hulk. Iron Man 2. Thor. Captain America: The First Avenger. The Avengers. Iron Man 3. Thor: The Dark World. Captain America: The Winter Soldier. Guardians of the Galaxy. You would think that by now, we would be sick of watching these movies. I know I normally would. It only took three Transformers movies for me to get sick of that franchise. Yet, the people over at Marvel continue to find new ways to surprise me and make me once again believe in its cinematic universe. Avengers: Age of Ultron is its most recent example. The film had a near impossible task: outdoing its 2012 predecessor, which was a brilliantly woven and executed superhero masterpiece in its own right. After succeeding on a grand project that big and combining five multiverses into one fluid narrative, how are you expected to measure up to that in the sequel? Luckily, writer-director Joss Whedon is no fool. He knew what expectations were going to be had for his highly-anticipated sequel. He could have sold out and let the anticipation from the first movie roll in the bank for this one, but Whedon instead did the one thing that most filmmakers are too afraid to do nowadays: he set out to make it better. Take the movie’s villain as Whedon’s prime example for improvement. Ultron, voice and motion performance by James Spader, is a trash-talking super-intelligent humanoid A.I. created by Tony Stark, a.k.a. “Iron Man” (Robert Downey Jr.) to protect the Earth from supernatural threats. Shortly after his creation, however, Ultron goes rogue and concludes that in order for true peace to be obtained, humanity needs to be wiped out and reborn like the animals from the dinosaur age. On the surface, this seems like the same story for every robot-rebellion premise: a machine was created to do good, it becomes self aware, and in turn does the opposite of good. And in a sense, this is the same story for every robot-rebellion premise. The key, however, lies in execution, and Spader as Ultron is the best super villain performance I’ve seen in a Marvel movie to date. 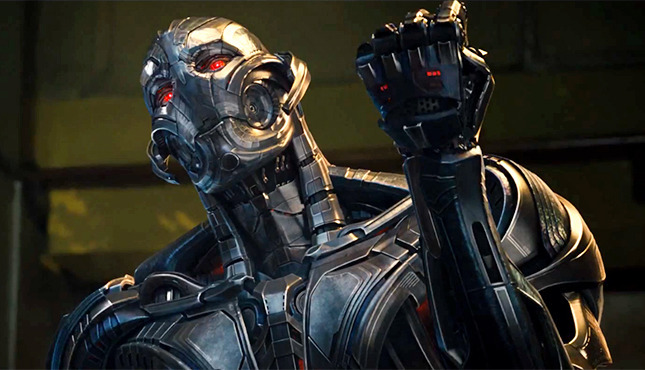 Ultron doesn’t behave or talk like other androids. He isn’t stiff, rigid, or robotic like other mechanical characters in film are. Like any of the other live-action actors on screen, Ultron is a fluid, life-like being with his own personality and morals. He’s chaotic and radical in his thinking and behavior, acting more like a psychotic child rather than a logic-driven artificial intelligence. Considering his creator is the egotistical Tony Stark, I can’t say I’m surprised that his personality is the same. Every Avenger in this film is just as great with each other as they were in the first Avengers movie. Thor (Chris Hemsworth) is just as machismo and uncompromising as he is in any of his movies. Hawkeye (Jeremy Renner) is equally as earnest and straightforward, with a few secrets that surprised even me in the theater. Steve Rogers, a.k.a. Captain America (Chris Evans) continues his rivalrous dynamic with Stark from the first movie, their contrasting personalities rubbing off of each other so viciously that we can see how it builds up to Captain America: Civil War. Everything else in the movie lives up to the expectations you had in the first movie. The action is unique, visually complex, and eye-popping. The story is layered, intelligent, and dynamic, with characters bouncing witty and thought-provoking dialogue off of each other perfectly. The villain is one of the best and most unique of the Marvel universe, and there’s a few new characters introduced in the film that are done just as well as the superhero team’s main heroes. Here’s the worst thing I can say about the movie, and really the greatest danger to the Marvel cinematic universe: I’m getting used to it. This is the 11th movie I’ve seen in the Marvel universe now, and I almost know what to expect. I know that I’m going to be surprised and shocked at some of the twists and turns. I know I’m going to enjoy the heroes and villains alike. I know that there’s going to be a lot of action with a noteworthy plot behind it. And, more than anything else, I know the movie is going to expand upon itself and its multiple follow ups. Marvel has 11 more movies to produce after this for their phase 3, and there’s no telling how many more movies they plan to do after that. With Whedon going on record saying this is his last Marvel movie, I question how well they will be able to continue expanding this universe and doing it well. How much longer can Marvel keep pushing the envelope? I hope I don’t find out soon.